I REMEMBER BEING ONE of the skeptics. Build a ship in the middle of nowhere, haul it to Lake Superior in Duluth and then eventually sail across the Atlantic Ocean to Norway. Who thinks that is possible? 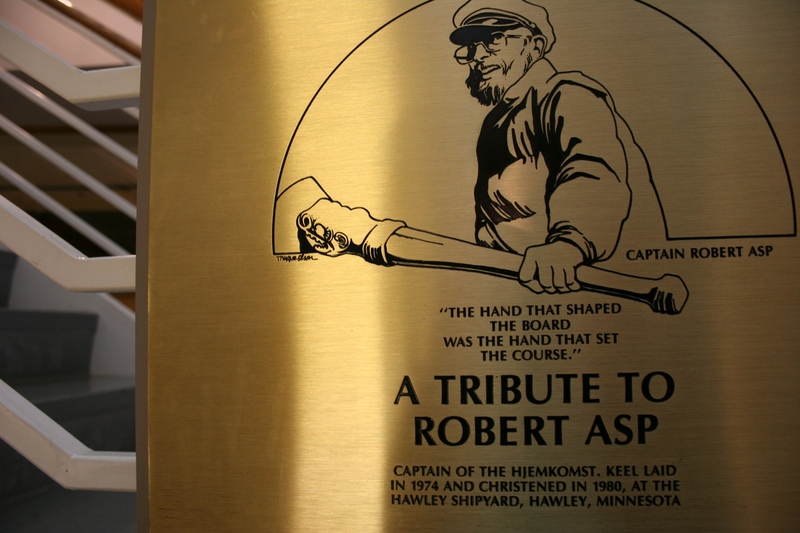 A plaque honoring ship builder and captain Robert Asp, located in the Hjemkomst Center, Moorhead, Minnesota. The steps, left, lead visitors to a deck for viewing of the open ship interior. Thirty years ago the Hjemkomst, a ship built by this Moorhead, Minnesota, junior high school counselor, with the help of family and friends, accomplished that 4,700-mile feat, proving the skeptics wrong. 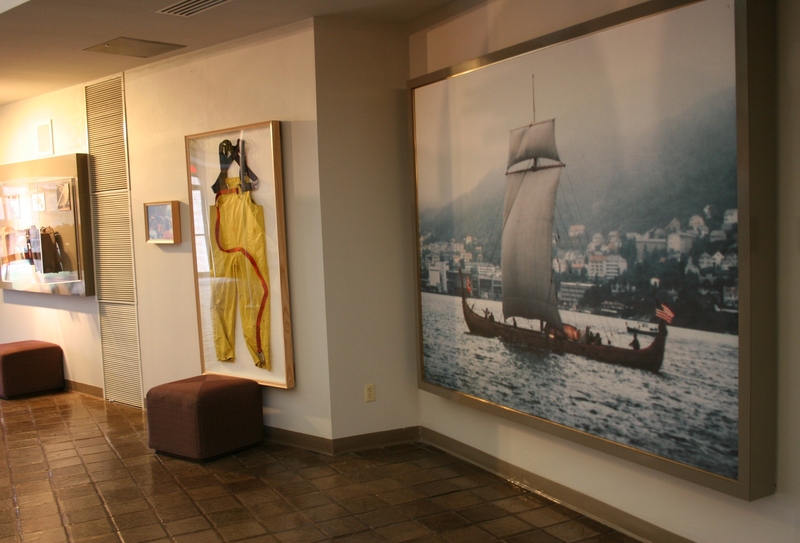 The photo on right, by Tim Hatlestad, shows the Hjemkomst sailing into the harbor of Bergen, Norway. Looking up to the mast and sails. Hearing the Hjemkomst story many years ago is one thing. 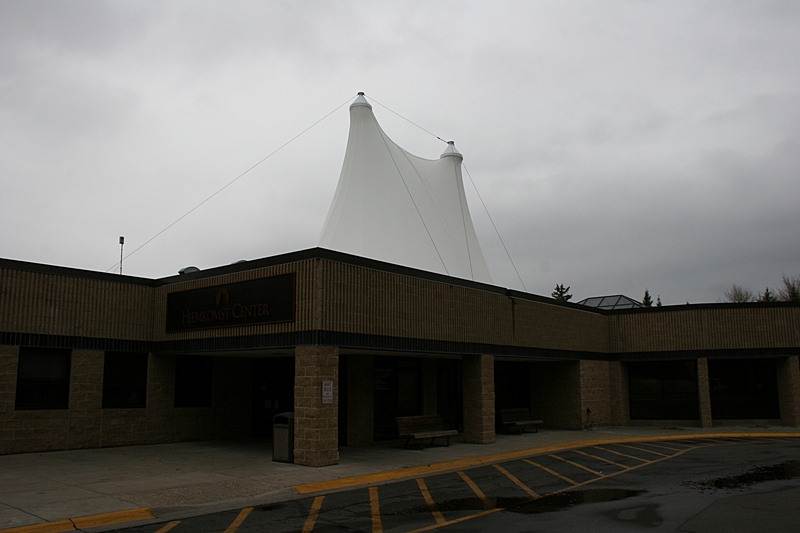 Seeing Asp’s ship permanently docked in the Hjemkomst Center in Moorhead is another. Only by viewing the ship and learning its story in detail can you truly appreciate the determination of a man to fulfill a dream. 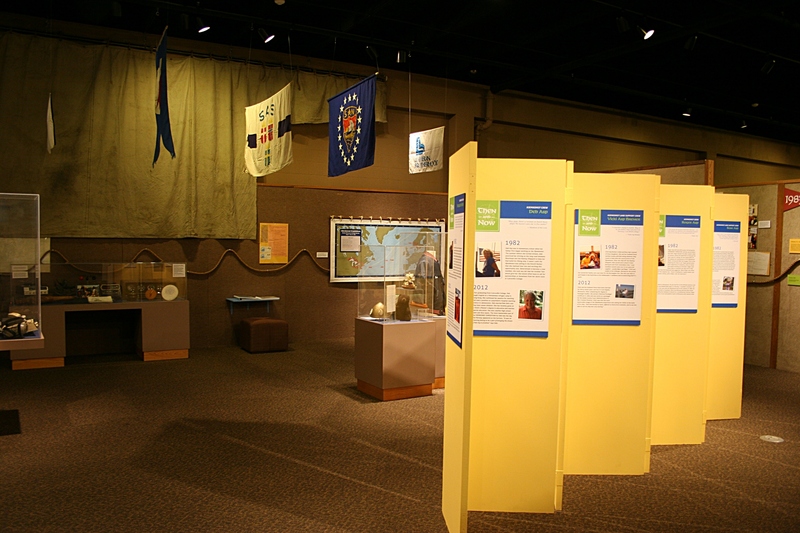 A small section of the museum exhibit on the Hjemkomst. 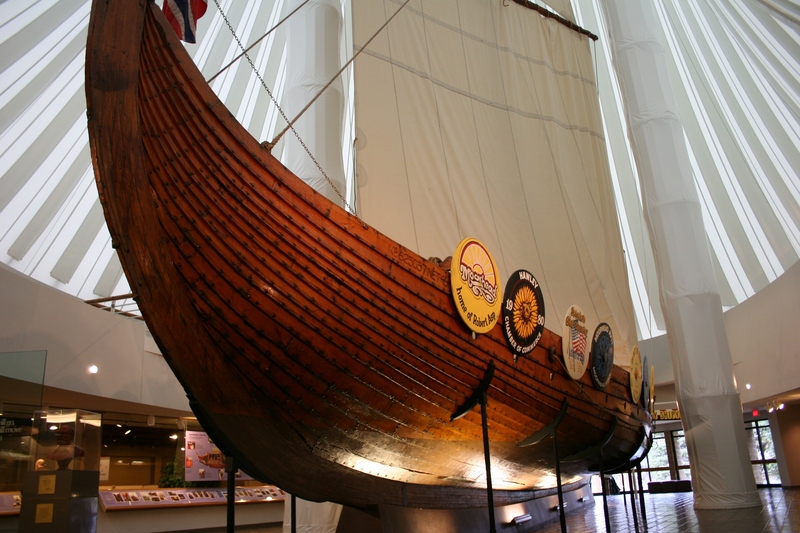 In the summer of 1971, Bob Asp and his brother Bjarne talked about their Viking heritage over coffee and joked about building a Viking ship to sail to Norway. Bob began searching in the Alvarado area, 18 miles north of Grand Forks, North Dakota, and six miles east of Oslo, Minnesota, in the spring of 1972 for oak trees with which to build the Hjemkomst. Eventually 100 oaks would be used in the ship construction. 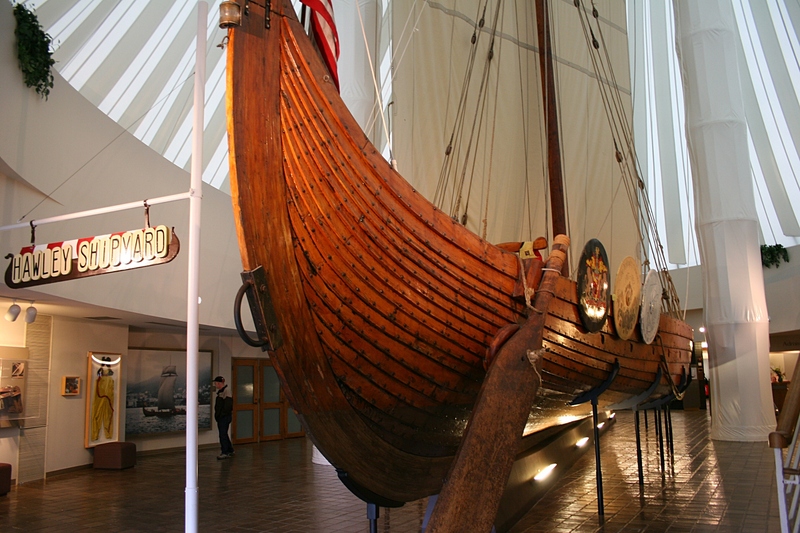 In November 1973, Bob leased a former potato warehouse in Hawley, 22 miles east of Moorhead, in which to construct his replica of the Viking ship Gokstad. Archeologists discovered the Gokstad in 1880 in Gokstad, Norway. Bob based the Hjemkomst on that ship. In 1976, Bob was offered $25,000 by a man who wanted to hire a crew to finish building the Hjemkomst for a tall ship parade in New York City. Bob declined the offer. In August 1980, the Hjemkomst was lowered into Lake Superior in the Duluth harbor. 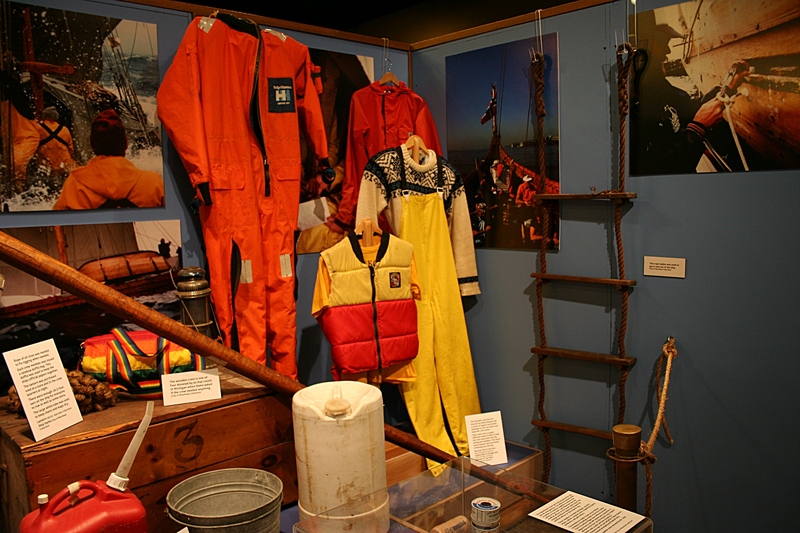 On May 11, 1982, a 13-member crew began the voyage across Lake Superior with 12 continuing on to Bergen, Norway. The trip would take 72 days, covering 4,700 miles. 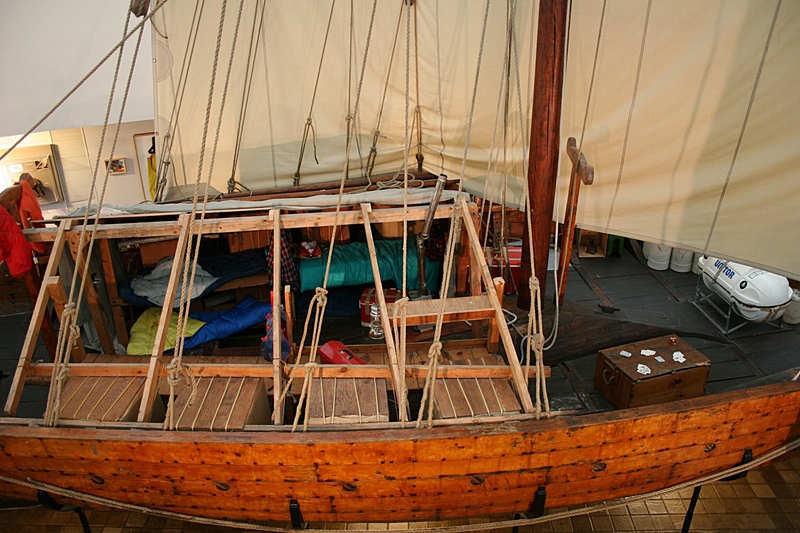 The ship was eventually returned via freighter to the U.S. and today is permanently at home in the Hjemkomst Center near the banks of the Red River of the North. As impressed as I was by viewing the actual Hjemkomst and by reading the detailed time-line of its construction, launch and voyage, I was even more impressed by the fortitude of Bob Asp. A dream come true “button” attached to the side of the Viking ship replica. He dared to continue on, even in the face of skeptics and illness (he was diagnosed with leukemia in July 1974). 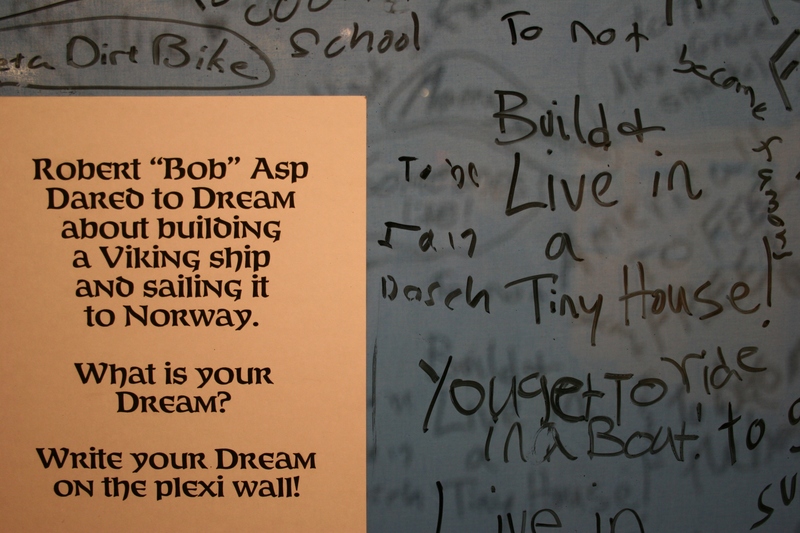 A plexi board upon which museum visitors can post their dreams. He dared to believe in himself. Therein lies a legacy of inspiration that teaches all of us the value of holding on to dreams. 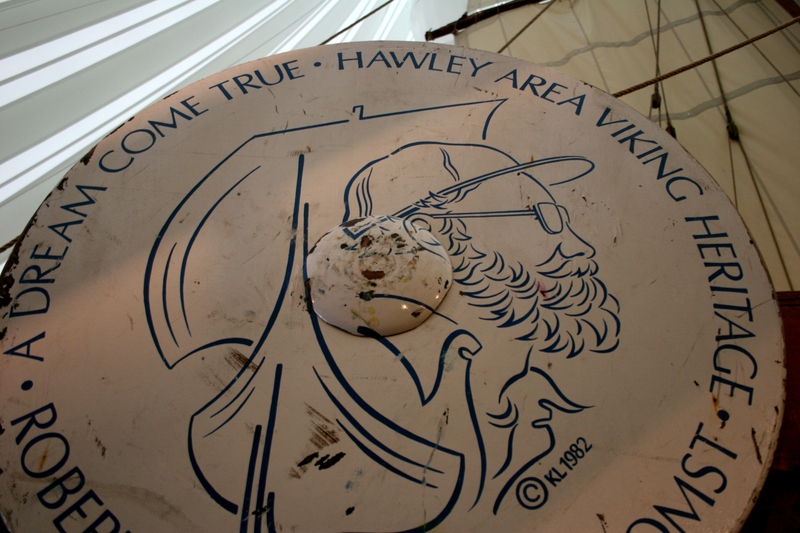 A sign of support from the grain elevator in Hawley, where the ship was built. 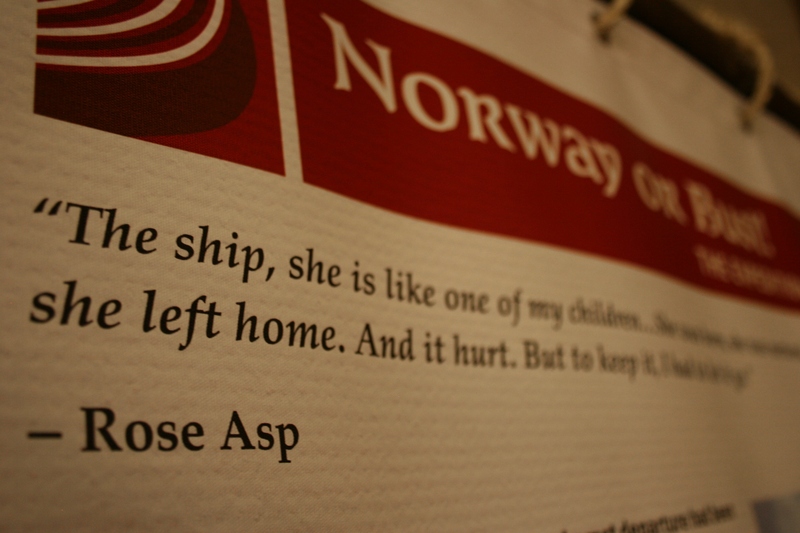 A quote from Rose Asp, Bob Asp’s wife. The interior of the Hjemkomst as seen from a second floor viewing deck. A sign on the ship honors the Asp brothers for their military service. 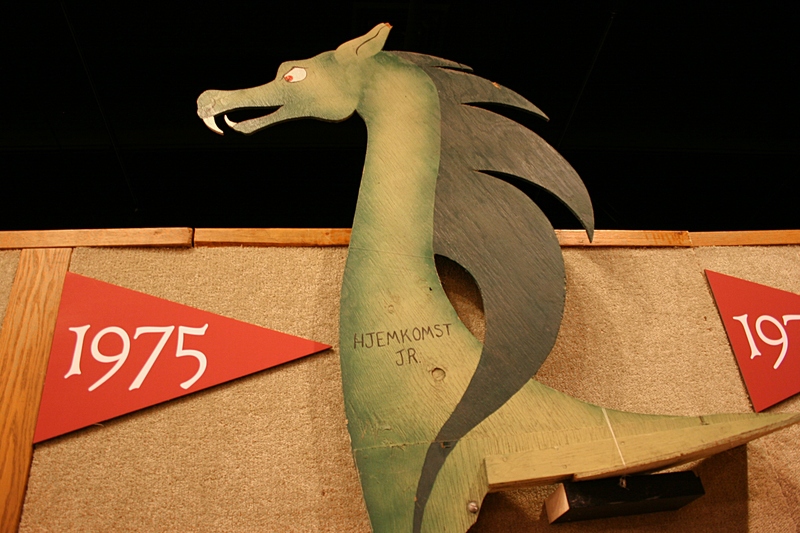 This dragon head was attached to a canoe, dubbed Hjemkomst Jr., and shown in parades to promote the ship project. Some of the gear and equipment from the Hjemkomst. Moorhead, Minnesota, Asp’s home and now the Hjemkomst’s permanent home. 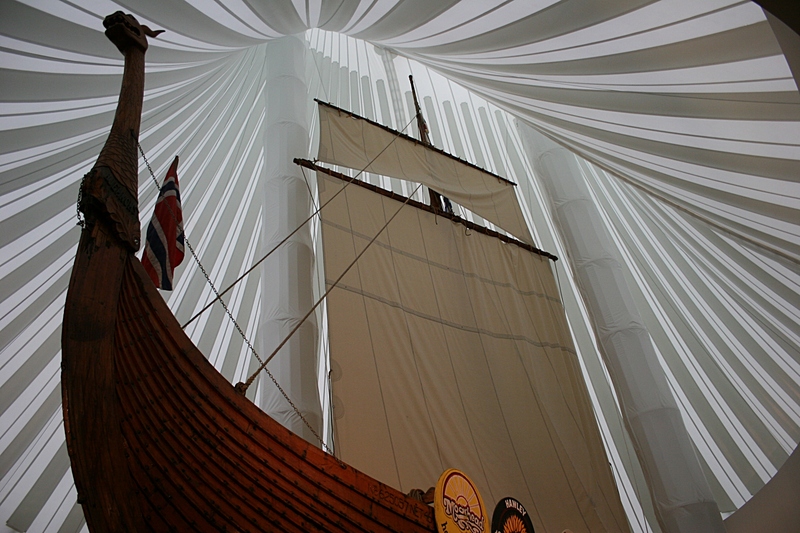 In the center of the Hjemkomst Center, the mast area of the Hjemkomst ship dominates the roofline. FYI: The Hjemkomst Center is open from 9 a.m. – 5 p.m. Monday-Saturday, from 9 a.m. – 8 p.m. Tuesdays and from noon – 5 p.m. Sundays. It is closed some holidays. There is free admission from 5 p.m. – 8 p.m. every third Tuesday. Admission prices vary. Click here to link to a $1 off admission coupon and for other coupon savings in Fargo/Moorhead.